Practical Bible Teaching: WHAT IS WORSHIP? Worship is something that is becoming more and more foreign to the average Christian. They attend church services on Sundays, some of which are called a ‘worship service’, but for many there is no clear understanding of the nature of worship. I find that we have moved further away from the biblical teaching of worship as when I first came into the things of the Lord. Remember, all you have to do is just be ‘off’ less than a degree but if you continue on that path, you will eventually be way wide of the mark—and we are now way wide of the mark for true worship. Our understanding has become limited by our language. Since we no longer receive teaching on many of the key aspects of the Christian life, we are left with extrapolating from what we see and hear. If that is all we ever hear, then most will equate worship with singing and paying. Worship is MUCH more than just those two elements mentioned above. The reality is that our entire life is to be an expression of worship (Rom. 12:1-2). Everything that you say, think and do should come under the umbrella of worship. But, that is not the purpose of this study. I want to focus on the corporate gathering of believers as they come together to worship the Lord. Does God command our gathering? Where did the idea of corporate worship come from? These are just some of the questions we will attempt to answer in this course of study. Worship is to honor with extravagant love and extreme submission (Webster’s Dictionary, 1828). 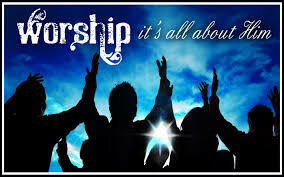 Worship is the full expression of a heart and mind in adoration of God. The full expression of your heart and mind, then, will include your voice and your body. When you go into the house of your local assembly, there should be an eager expectation of what is about to take place. For me, that is the beginning of what we ordinarily call a worship service in today’s church. I will begin to deal more specifically with this aspect of worship as we continue this study. "For me, personally, that eager expectation begins with the anticipation of getting together with my spiritual family. This anticipation is so strong in me that my blood family has always been bothered by my desire to “get there early.” I don’t want to be “on time,” and I certainly despise being late. I want to be there as each member arrives so that I have time to glean and gain from their presence." Wow - what an awesome statement!!! I never knew that this is the reason that you are so early. I love this about you! Thanks. Been that way for more than 40 years now.